G protein-coupled receptors (GPCRs) constitute the largest family of membrane receptors in eukaryotes and, due to their broad involvement in physiological processes, have become the largest family of drug targets in biology. Recent crystal structures, molecular dynamics simulations and spectroscopic studies have provided insights into how GPCRs interact with ligands and G-proteins. However, despite these advances, our understanding of the molecular mechanism of their activation process remains incomplete. Metabotropic glutamate receptors (mGluRs) are dimeric class C GPCRs that modulate neuronal excitability, synaptic transmission and plasticity, and serve as drug targets for neurological disorders. We used single-molecule fluorescence resonance energy transfer (FRET) to probe the activation mechanism of full-length mammalian group II mGluRs (mGluR2 and mGluR3). 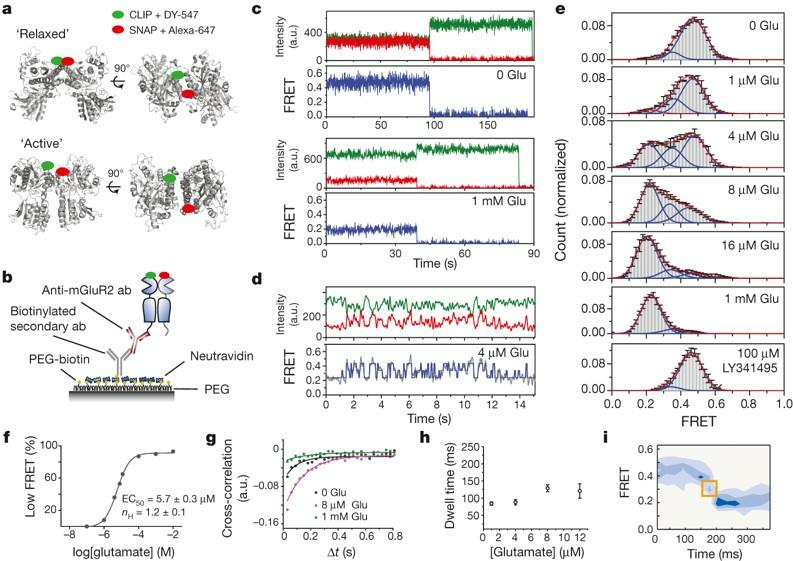 We demonstrated that the ligand binding domains of mGluRs undergo conformational change between a resting, an activated and a short-lived intermediate state. Different orthosteric agonists induce transitions between the same conformational states with efficacy determined by the degree of occupancy of the active state. Interestingly, while in the absence of glutamate mGluR2 is inactive, mGluR3 displays Ca2+-dependent basal dynamics, which lead to spontaneous protein activation. Our results support a general mechanism for the activation of mGluRs in which agonist binding induces closure of the ligand binding domains followed by reorientation of the dimer interface. Reza Vafabakhsh received his doctorate from the University of Illinois in physics in 2012 in the laboratory of Dr. Taekjip Ha. Currently Reza Vafabakhsh is a Merck fellow of Life Sciences Research Foundation doing his postdoc at the Molecular and Cell Biology department at UC Berkeley in the laboratory of Dr. Ehud Isacoff.